Hope not, but if so, maybe this Great Impressions creation will cheer you up! 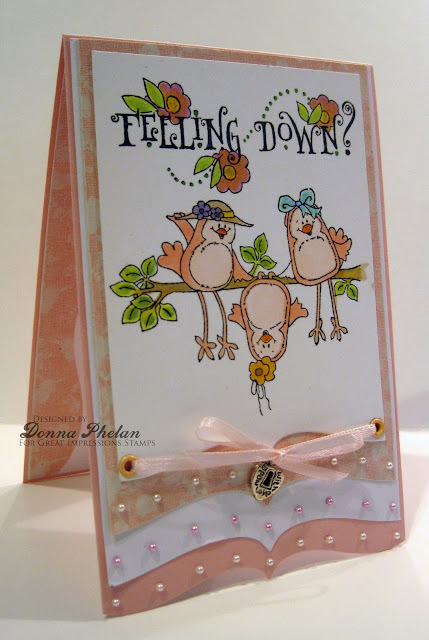 This card uses the beautiful sentiment framed with flowers, E879 Feeling Down and sweet little images G525 Birdie Friends, how cute?!?! Using bracket dies I made several little layers topped with itty bitty Adhesive Pearls. A couple of eyelets threaded with some pale pink ribbon tied in a bow, with a little heart charm that says made with love. Don't forget about our GI Monthly Challenge, Add A Sentiment! Use any of the fantastic Great Impressions stamps, upload your creation to our Customer Gallery for your chance at winning some awesome year end prizes! Lol Donna this is just delightful and will definitely cheer up the recipient. I adore this card!!! Not only do I adore the sweet image and the way you colored it, but I really love the soft colors, the border and those beautiful pearls. That's a lotta pearls, and they add so much. Oh, and that cute little charm. Well done!!!!! What a fun feminine card! I love the layering of the dies you used for the bottom edge along with the pearls and charm. It adds such great interest! Donna, this is just too too tweet! Love your beautiful bordering at the bottom, and the pearls add such a feminine touch! Great job!